Natural Beeswax Ointment Bioaroma was added to your shopping cart. Natural Beeswax moisturizing ointment by Bioaroma with pure olive oil, dittany, chamomile and calendula oil. Ideal for skin problems, dry, irritated skin and lips. 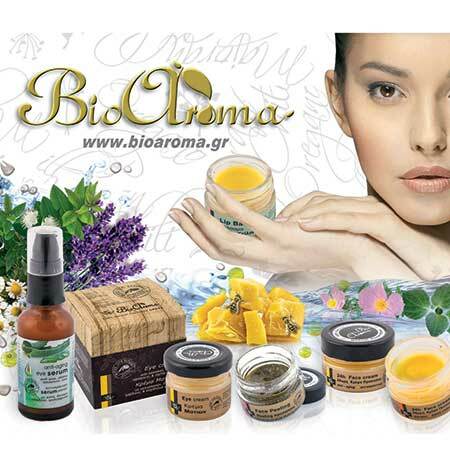 Cretan Beeswax moisturizing ointment by Bioaroma with pure olive oil, dittany, chamomile and calendula oil. Ideal for dry, irritated skin and lips. A traditional beeswax ointment from Crete encompassing the best local essential oils from dittany, chamomile and lavender, infused with Cretan liquid gold – extra virgin olive oil. Helps relieve dry and irritated skin and lips. Apply it all over your body as often as needed, on dry skin, to sooth burns, wounds and other skin problems such as eczema. Avoid contact with eyes since essential oils could cause eye irritation. Ιngredients: Extra virgin olive oil, beeswax, Caprylic/Capric Triglyceride, St. John’s wort flower extract, Orange Oil, Dittany Oil, Lavender Oil, Chamomile Oil, Calendula Flower Extract, and components of 100% natural essential oils such as Tocopherol, Linalool, Limonene.